The offered strapping plant is suitable for manual clamping application & heat-sealing application. • Paper Packing Box Strapping Extrusion Line Extrusion Generates Plastic Sections of Continuous Length through Plastic Extruder. Plastic Granules are melting by required elements through Plastic Extruder to form a furnished product. 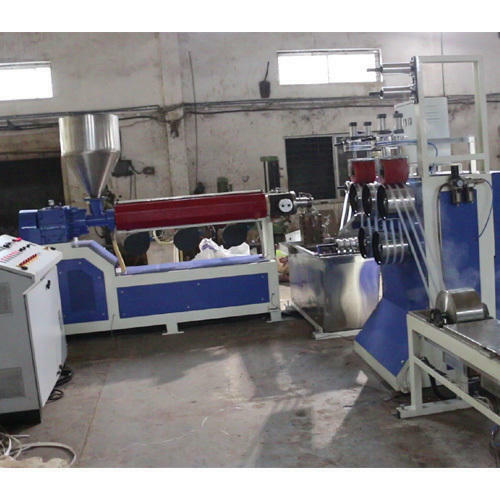 Box Strapping Extrusion Line Process is carried out through Various Components like Extruder, Quenching tank, first godet, hot water tank, stretching godet, online single color printing machine, embossing unit, Stabilizing unit, third godet unit and wind on core winder.